There are several ways on removing acne scars. The appearance of acne starts during puberty when the body actively produces hormones that causes too much sebum in the skin. This skin stage may pass but it would definitely leave marks to haunt your appearance forever. Treating acne scars can be done through natural inexpensive ways and dermatological procedures that would probably cost a lot. However, acne scar treatment still depends on the mildness and severity of the scar. 1. Hydration is the key. It has been proven that water is one of the best natural methods on how to remove acne scars and prevent acne breakouts. Drinking at least 8 glasses of water or more helps your skin to shed those unwanted dead skin cells. 2. A lot of people are recommending the use of Vitamin E capsule for those scars. You might apply it topically to the affected area by pricking a spot in the capsule and apply the oil to the scar. Another option is to take it orally to have that cell renewal from the inside. 3. Rosehip seed oil is also an effective remedy on how to remove acne scars. This is an anti-ageing and anti-wrinkling agent that helps the skin to regenerate. Massage it on the scar twice a day. 4. 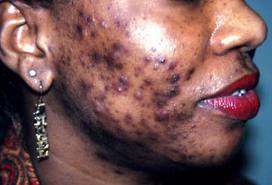 Eating a balance diet may help in removing acne scars. The more nutritious foods you include in your meal, the faster the scar will heal. It helps in building the skin cells and gives a healthy skin glow as well. 5. Combine rose water and paste of sandal wood and apply it on the spot where the scars are. Leave it overnight then rinse with cold water the next day. Aside from the natural ways of removing acne scars, there are also dermatological procedures that would definitely give you a much faster result. However, pregnancy and other health conditions may hinder your want to undergo these procedures. Here are some of the hi-tech methods on how to remove acne scars effectively. 6. Nowadays, not only certified dermatologists do a dermabrasion but facial salons as well. Dermabrasion is the removal of the top skin layer using a machine that chafes off the skin. Once the skin heals, the top layer will then have a smoother and clearer appearance. 8. You may also have a chemical peel procedure. This is just like dermabrasion. The only difference is that the top layer of the skin is peeled off using chemicals not machines. This is not a very advisable procedure for all since some people may have allergic reactions to the chemicals. With all the available choices for treatment, you surely would not have an excuse as to why your acne scar is still obvious. It’s your choice whether you would opt for the natural way or the dermatological procedure on how to remove acne scars. It’s dat all the secrets.pls i need more of it. Thank Mariama you for your enquiry. These products can be purchased from any natural health food shop such as Holland and Barrett or your local chemist. Trilogy Certified Organic Rosehip Oil is 100% organic rosehip oil. It contains 80% of the essential fatty acids (Omega 3, 6 & 9) and vitamins needed to renew and revitalise all skin types. This super-fine oil absorbs instantly, allowing the skin to breathe as it works to moisturise and condition skin restoring suppleness and supporting skin elasticity. 100% natural oil for face and body immediately softens and smoothes skin and with cumulative use will help you restore and maintain healthy, radiant skin. We hope the above information is useful. Thank you for your email regarding pimples, the contents of our newsletter should provide you with an answer. Thank you for your email.This should help. Thank you for your email.The answer to your question is in our newsletter along with more. Rosehip is the fruit of the rose plant. I am a Chemist and I can tell you this for sure, 2% salicylic acid will do miracles for your whiteheads and benzoyl peroxide for blackheads (OR use benzoyl peroxide at night and salicylic acid in the morning). you can buy either of the two at ‘Beauty Options’ in town for only KSh 1500-2000. you’re welcome! This site helps in maintaining skin healthy and smooth.